Directions: Take Rt. 113 in East Conway towards Evans Notch. The trailhead is about 0.2 miles past the Cold River Camp in Chatham. 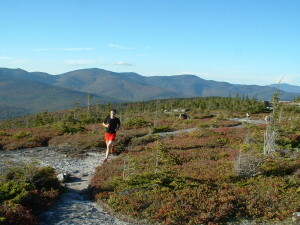 The Baldface Loop Trail is one of the coolest runs I have ever done. This loops is steep in spots but flattens out once you reach the ridge line. The views in this area are spectacular and the footing once above tree line is pretty good. The descent down from North Baldface can be tricky, but easier than descending from South Baldface.